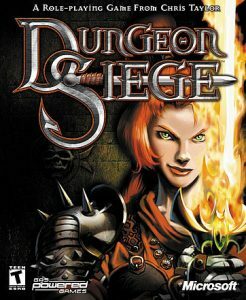 I’ve been looking forward to playing Dungeon Siege for a while. I’ve tried the RPG before (having owned it for quite some time) but never got that far in – too many other good things to play. The Diablo style, over the shoulder play felt unique though, feeling advanced at the time, while streamlining a lot of the complexities of other RPGs. It’s time, then, to jump in and play more than ten minutes of this game. Not just get a feel, but see what happens when I get far enough to see a city and do some quests. Dungeon Siege is an entertaining game where I feel time may have overtaken it a bit. The graphics feel a bit off, in a way that hasn’t aged well, but at least it tries to create bigger settings and areas to fight in – just constrained with loads of cliff faces and VERY dense forests. It feels like it tries, but doesn’t quite have the technological capability to pull it off. Beyond that, it’s mostly a monster fighting fest, and a lot of it feels a bit MMO-like – go out to this area, kill loads of monsters and deal with some related quests. So far, the main quests felt like they’ve been “Get to the next area”, but I suspect that will change at some point. There is a fairly complex party control system. You control one directly, while directing the rest through a fairly straightforward interface. There are quite a few options there, but it’s laid out well enough that it’s not as overwhelming. Party members do seem to drop in and out a bit, which is unfortunate, as it encouraged me to make my main character a generalist in a game that seems to encourage specialists. There are plenty of joinable characters to give you options, although most of them didn’t seem to have as much personality. I am curious how that develops. The character system is learning through use, another place that supports the specialist system. It’s just a few bars going up, which makes the system simpler than most, but it’s also streamlined enough to make the game simple. The main customization is on items, with plenty of them dropping and loads of modifiers seemingly able to be applied. It seems to be part random, but I haven’t played enough to see to what extent that’s the case. As always, money is scarce in the early game, so I was struggling a bit to diversify my magic, but I felt like i was starting to see more options. The spells certainly seemed varied enough for it. It’s hard to not compare this game to Diablo‘s loot systems and World of Warcraft‘s quests and I’m pretty sure the former was looked at when this game was being developed, down to the backpack puzzles that’s in plenty of RPGs, but feels familiar here. Dungeon Siege uses it all well, with the environments creating some variation in a way that suits the era. It’s dated, but still fun to play and a good set up for what’s to follow.